Did you miss my blog post in December? You were probably too busy flying by the seat of your pants in a bid to beat Santa’s sleigh to notice I’d gone AWOL. Actually I was the one on the bike with ET flying across the sky, trying to get to the M & S food store before the doors closed. Sorry I didn’t stop to wave. The Alderson household had to go cold turkey all over Christmas and the New Year- and I don’t mean what we ate for our Christmas dinner! 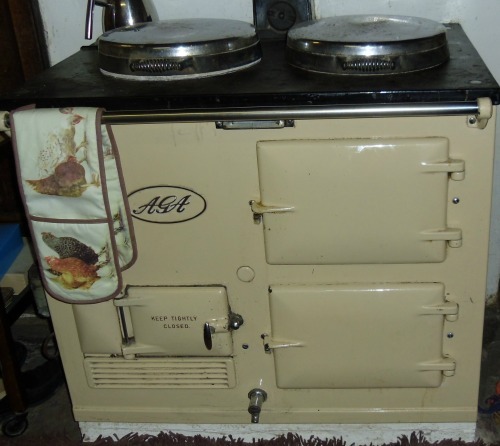 No, our beloved Aga was the problem. Now, despite the fact that she needs a facelift and dates back to the 1930s, we’re very fond of the old girl, and so are all of our visitors. The first thing they do is park their bottoms in front of it, and then they luxuriate in its warmth, loathe to give up their prime position in front of the oven door. The Aga is the heart of our home, so when it suddenly went cold on us, a shiver crept down our collective spine. We were forced to admit our long-standing addiction to opening the oven door to toast our derrières (I thought I’d use a polite French term as it’s a cheeky topic). The festivities didn’t seem quite the same without the baking warmth of the Aga, though luckily we have an electric oven to use as a back-up and still had a nice turkey dinner. It’s not very good for derrière- warming though! I won’t say anything else about Christmas, except to pass on a tip to anyone who lives in a big old house. Don’t use last year’s Christmas crackers unless you want to pull them and find a dead spider inside! My son-in-law’s face was a picture when a mummified arachnid popped out instead of a paper hat! And on a lighter note…. when Floss the Sheepdog took me for my daily walkies this week I noticed how the days were lengthening again. Another few weeks will see an easing of my SAD symptoms and I might come out of hibernation for more than just another snack. Happy New Year dear Follower. Thanks for reading my blog and I wish you all the best for 2015! Categories: Farmhouse blog, Uncategorized | Tags: Aga, Christmas, Shropshire, Shropshire copywriter, Shropshire Journalist | Permalink.